Dr. Krystal Turner and Dr. Natalie Topeka opened TurningPoint in 2002 with the hopes of building a center focused on prevention and holistic healthcare. 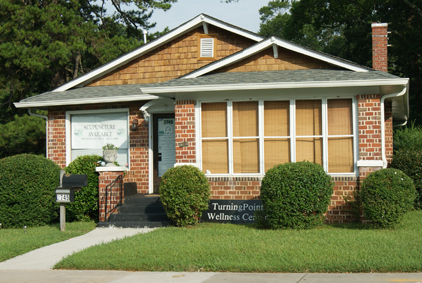 Today TurningPoint offers Chiropractic Care, Acupuncture and Massage Therapy. Our departments work together to ensure each patient receives the best care possible. Consultations are available to discuss you individual needs. Let us make a Turning Point in your life today. Since Opening Turning Point has been very active in the community. Belonging to many local business and social groups. TurningPoint Associates have served on many boards and advisory committees including the East Point Business Association, Herzing University Health Care Board and Ultimate Medical Academy advisory panel. TurningPoint Won a Trail Blazer award in 2004 and was featured as East Point Main Street Association's business of the month in August 2012. Natalie Topeka DC– Dr. Topeka graduated from Life Chiropractic College with honors in 1991. She owned and practiced at Loving Hands Family Chiropractic from 1991 – 2001, until making the decision to open Turning Point Wellness Center in East Point. She also spent time as a clinic instructor at Life University, from 2000-2001. Dr. Topeka is a very skilled adjustor and still has patients who have followed her from her first practice till now. Originally from New Jersey, she moved to Atlanta to obtain her chiropractic degree. Krystal Turner DC, B.S.– Before obtaining her chiropractic degree in 1997, Dr. Turner graduated from Auburn University with a degree in Microbiology. She has a passion in teaching and education. In addition to teaching health and wellness workshops in and around the area, Dr. Turner has also taught at several local and online colleges and universities. Dr. Qiao, LAc, TCM– Graduated from Shanghai Medical University and Shanghai Institute of Acupuncture in Meridian, China. He spent seven years to complete all courses in both western medicine and Traditional Chinese Medicine (TCM). Dr. Qiao has been practicing Acupuncture since 1982. He worked at a local Shanghai Hospital as a TCM doctor and in Shanghai CDC as an MD doctor. He was a member of the Shanghai Acupuncture & Moxibustion Society. There were thousands of visits and hundreds of patients treated by him each year in China. After coming to the United States, Dr. Qiao passed two national exams (NCCAOM ). One was in Acupuncture and the other was in Chinese Herbology. He is licensed in Texas and Georgia. He has been a practicing in Atlanta since 2001. He specializes in stroke rehabilitation, supplementary treatment for cancer and AIDS, Chronic Fatigue Syndrome, Pain Management, Depression and Insomnia. Khyree Philmore, LMT– Khyree received his training at Atlanta School of Massage, obtaining his LMT certificate in 2008. He is also certified in Kinesiotaping and has advanced training in aromatherapy, cranial-sacral technique and lymphatic drainage protocols He has a thirst for body knowledge and mechanics and spends much of his free time learning new applications and techniques.